Sara Hyoun, 39, is a 4th-year medical student at GW and a former actress who will be returning to Hollywood as a doctor, not just someone who plays one on TV. Fourth-year medical students all across America opened envelopes in a synchronized ceremony revealing their residency assignments. It's called Match Day, and one GWU student's match puts her right back in the center of her Hollywood roots. For many of the soon-to-be doctors, their stories are pretty much the same: pre-med majors who have dreamed of becoming doctors since they were children. But not for Hyuon. She's a former actress and film editor with huge Hollywood credits under her belt, like "Being John Malkovich" and "Con Air." But at age 35, she decided to take on her most dramatic role yet. "It was somewhere in my later 20s, early 30s that I felt that I wanted to give back to society in a different way," she says. "Doing entertainment as an actress, it was fun, it was great, but I didn't feel like I was giving back to the community." So Hyuon started volunteering in an L.A. area emergency room and taking pre-med courses at the University of California Los Angeles. "I thought, let me go volunteer at the hospital," says Hyuon. "And it was fantastic from the get go." 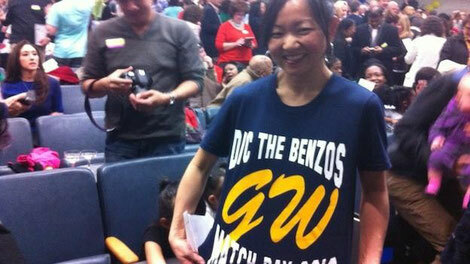 She then applied to medical school at The George Washington University and was accepted. "And I went for it! I was like, 'let's do this!'" Now four years later, with a husband and two toddlers in tow — one who was born during her third year of medical school — the 39-year-old is heading back to Hollywood. But this time as a doctor, not just someone who plays one on TV. Hyoun's residency will be spent at the place where she first fell in love with medicine: UCLA. The medical school's associate dean, Scott Scroth, says he couldn't be more proud of their first actress-turned-doctor graduate. "She's going to be going to UCLA in psychiatry, and it's kind of an amazing moment when they open their envelope and find out where they're going to be for their next four plus years," he says. Hyoun's area of concentration will be in women's mental health. Thanks for a marvelous posting! I quite enjoyed reading it, you will be a great author. I will always bookmark your blog and will often come back later in life. I want to encourage continue your great posts, have a nice afternoon! Wow, awesome weblog format! How long have you been running a blog for? you made running a blog look easy. The total look of your web site is fantastic, let alone the content material! I do believe all of the concepts you have introduced on your post. They're really convincing and can certainly work. Nonetheless, the posts are too short for starters. May you please prolong them a bit from subsequent time? Thank you for the post. For the reason that the admin of this website is working, no question very rapidly it will be renowned, due to its feature contents. Hello to every one, as I am truly keen of reading this web site's post to be updated daily. It contains nice stuff. magnificent put up, very informative. I'm wondering why the opposite specialists of this sector do not understand this. You must continue your writing. I'm confident, you have a great readers' base already! Amazing! Its genuinely awesome piece of writing, I have got much clear idea about from this piece of writing. Please let me know if you're looking for a writer for your blog. You have some really good articles and I feel I would be a good asset. If you ever want to take some of the load off, I'd love to write some material for your blog in exchange for a link back to mine. Please blast me an email if interested. Cheers! © 2019 Markette Sheppard. All rights reserved.